Lots of Beneficial features Are Still Here! Sysessential for EML to NSF Converter is one of the known software solutions helpful when it is to export large number of emails from EML file format into NSF file format. You can rely on the functioning of the application because of its ease to perform swift data migration in few minutes. Sysessential for EML to NSF Converter is one of the known software solutions helpful when it is to export large number of emails from EML file format into NSF file format. You can rely on the functioning of the application because of its ease to perform swift data migration in few minutes.Software developers make right use of latest techniques for making data move from EML file format into NSF format. The advanced and latest technical skills results into quick data, accurate and complex-free data move. Sysessential for EML to NSF Converter application supports working with all the Lotus Notes editions. You can install the application without considering the thought regarding the specific Lotus Notes edition you are utilizing. But remember that Lotus Notes installation is one of the most prominent requirement to run the tool otherwise it will not produce beneficial consequences. Ensure for making purchase of the software without considering any particular Windows versions as tool supports working with all the MS® Windows editions such as ME, NT, and many more. How effective Free Demonstration is before investing in the application? The Trial run of Sysessential for EML to NSF Converter serves the vital purpose of testing the application before making purchase of the software in fully operable mode. Just Download the application and find out essential features and working procedure in a row. 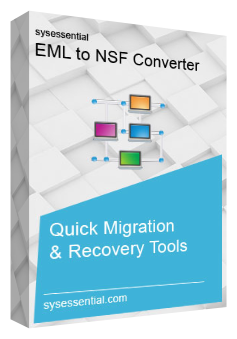 With demo edition, you can test the functioning and conversion method as tool supports for migrating first 10 EML files into NSF files. Decide for final version after trying trial run. What is the vital email migration techniques used? The different techniques such as ‘Quick Files Search’ like techniques developed via software developers make it unique from others. The usage of such techniques will let convert .eml files into NSF format. Is tool capable of making swift data move? The application is comfortable when it is to make speedy migration of emails from EML file format into NSF file format. The investment in the software tool will lead into execution of large number of EML files into NSF without causing data loss at any moment. What is the EML file size limit that tool supportive of? There is no specific file size limit for EML files as software supports even large sized EML file format. Hence, do not lose the chance to make use of the application for making data move from one email application into another. Though lots of heard about Sysessential for EML to NSF Converter tool but after using the application, I realized how effective the application is. It has converted large number of EML files into NSF file format in just few minutes. I was happy with the conversion techniques that tool really utilize. I was happy with the conversion methods and want others to use the software for ultimate beneficial results. The need to migrate large number of emails from EML file format into NSF made me perturbed and there I realized for taking commercial help. The search for third-party tools consumed my few hours but at last I got Sysessential for EML to NSF Converter application which migrated enough of the emails from EML file format into NSF files. I was happy with the acquired results.